In April, 1940, the 10th Battalion Worcestershire Regiment, very weak in numbers, was concentrated in Malvern (with a Recruit Company at Pershore) under the command of Lieut.-Col. D. Chesney, O.B.E. In June came a move to Kingsclere, near Newbury, and a few days later the Battalion reinforced by a large draft, was en route for Belfast in N. Ireland. In December a further move was made to Cookstown in Co. Tyrone, where field force training began in earnest. During these two years the 10th Bn. remained in N. Ireland in 61 Infantry Division as a Unit of 183 Infantry Brigade, moving in turn to Ashbrooke in Co. Fermanagh, Castlerock, and finally Londonderry. In November, 1941, Col. Chesney vacated command of the Battalion and was succeeded by Lieut.-Col. A. T. Burlton. 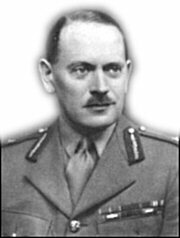 Lieut.-Col. C. P. G. Wills assumed command in May 1942. In January, 1943, the Battalion moved, still with 61st Infantry Division, to Chalfont St. Giles in Buckinghamshire, and there mobilised and carried out intensive training to play its part as a Battalion of an Assault Division and later as a "Follow-up" Division. These things, however, were not to be, and in the Autumn of the same year the Division moved to S.E. England. The 10th Bn. was stationed at New Romney in Kent and became the Pluto (Pipe Line under the sea) Counter Attack Bn. in the Dungeness area. This task, punctuated by many practices and alarms, continued until the end of the year. Capt. J. D. Ricketts, Major A. R. Harrison. 1944 — OPERATION "BIG BOB"
In January, 1944, two Battalions of 61st Infantry Division, the 4th Northamptonshire and the 10th Worcestershire, were selected to play an important role in the deception plan, forming part of the Grand Plan for the Invasion of North-West Europe in the Summer, and were placed under direct command of 21st Army Group. 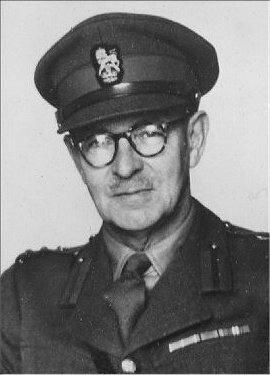 Brigadier C. P. G. Wills, O.B.E. Both Battalions were to be trained secretly in the construction and launching, by night, of dummy Tank Landing Craft, and on 2nd February this training began at Waldringfield by the Deben, near Ipswich. There were two types of dummy craft, the smaller measuring some 112 ft. by 35 ft. and weighing 13 tons. Although assembly differed considerably in detail, the main frame of both types consisted of specially manufactured tubular scaffolding, fitted with commercial oil drums for flotation, and covered with painted canvas to present an exact picture both to air and ground. Funnels, ventilators, chart boxes and other essential features were fitted during various stages of construction. Craft were assembled on land and incorporated 48 sets of metal wheels enabling launching to be effected on completion. A skilled team of 30 Officers, N.C.O. 's and men could complete a craft in some 7 hours under good conditions in hours of darkness. Launching involved tides, tugs, wind, winch lorries, brain, brawn and a little luck. By the third week in April approximately 600 Officers and men of each Battalion had received training, and it was not long before operation orders were received from 21st Army Group. The 4th Northamptonshires were to be responsible for fleets at three sites on the East Coast. The 10th Worcestershire were to build, launch and maintain dummy fleets at Dover, Folkestone and Wolverstone, on the River Orwell, near Ipswich. Detailed reconnaissance of sites began, bards were constructed, building areas were cleared and levelled (entailing the removal of thousands of tons of soil and two houses on the Marine Parade at Dover), and stores of all kinds began to arrive from factories and Naval and Military Depots. Under the orders of the Flag Officers in Charge, buoys were laid by the Royal Navy and fleets of small craft with their crews of Naval Ratings, Royal Marines, R.A.S.C. Motor Boat personnel and selected civilians were assembled with an eye to launching, towing, maintenance and animation when the operation proper began. On 23rd April, "B" Company (Major M. A. Gibbins) moved to Folkestone. Two days later a large detachment comprising "A" Company (Capt. J. G. Hayes), "C" Company (Major W. A. M. Chippindale), and "D" Company (Major W. L. Newcombe), all under the command of the Battalion 2nd-in-Command, Major D. J. Stevens, moved under canvas on either side of the River Orwell, near Wolverstone. Battalion Headquarters, "H.Q." Company and "S" Company (Major J. D. Ricketts, D.S.O.) remained at Dover, where "S" Company became immediately responsible for operations in the Harbour. Security personnel protected each area and the secret continued to be well kept. By 21st May deliveries of component parts of craft, ex factory, were completed. These deliveries alone entailed the move of some 700 lorries each over nearly 2000 miles. Final preparations were made with the willing co-operation of the Royal Navy and detachments of the Royal Engineers, and all stores were laid out in carefully camouflaged dumps. On 19th May orders to begin operations were received and at 0300 hrs. on 20th the first BIG BOB (the Code name for the craft) became waterborne in the River Orwell. By 15th June the fleets were in being and the Battalion had built and was maintaining at; Dover	42 craft, Folkestone	17 craft and River Orwell	59 craft. The difficulties experienced everywhere were considerable, but were perhaps nowhere greater than at Folkestone, where the sands (previously adjudged sufficiently firm) could not support the weight of the devices, and the united efforts of men, winch lorries, carriers and tugs were often unable to seize the fleeting opportunities offered by the tide for launching by flotation. On 6th June, "D" Day arrived and the invasion of France began. For several days afterwards, the gale, which jeopardised the landing of men and material on the Normandy beaches, raged. BIG BOBS were designed for 4 weeks' flotation in sheltered waters. At Dover and Folkestone they were subjected to weather conditions that played havoc with their metal frames and canvas coverings. By day and night salvage, repair and maintenance were carried out on the water by "B" and "S" Companies under difficult conditions, and always at the back of everyone's mind was the question: "Had German air reconnaissance discovered the secret?" As calmer weather arrived the answer became patent: the German 15th Army continued to man the Pas de Calais in the expectation of another landing to seize the Channel Ports and destroy the flying bomb bases. On 13th June German cross channel guns shelled Folkestone harbour and 46 large calibre shells landed in the area. Some damage was done to vessels, but the German overseas wireless claim on the following day that hits on concentrations of reinforcements and invasion craft had prevented the fleet from leaving harbour was perhaps an exaggeration. Shelling from time to time took place at Dover, and Major Ricketts, Lance-Serjeant A. H. Giles, Serjeant J. H. Armishaw and Private R. Crump were wounded, the last seriously. The time for which the fleets were to be kept in being was continually extended until it became evident that, if they were to retain their proper appearance, a partial replacement programme would be necessary. This was successfully accomplished towards the end of July. By 7th August the fleet at Dover was increased to 52 craft, while those at Folkestone were removed. On 8th August Colonel Wills relinquished command of the 10th Worcestershire to assume command of the 9th Battalion, and Major Stevens, now promoted Lieutenant-Colonel, assumed command. The operation was finally concluded on 15th September 1944. That the BIG BOB operation played a vital part in holding the German 15th Army in N.E. France throughout the critical months of the Normandy Battles there is no question. "General Montgomery, C.-in-C. 21.A. Gp., is anxious that the threat created to Northern France by the dummy landing craft under your control should be continued as long as possible. Whilst it is fully realised that the launching and maintenance of the craft is an extremely arduous task, it is requested that every possible effort may be made to ensure that as much life and animation is given to the craft as possible. You should explain to all ranks that they are playing an extremely important part in the plan and that, in view of this, they are required to make as great an effort as Battalions deployed in the battle area." "Now that the BIG BOB operation is completed, I should like to take the opportunity of thanking you and those under your command for the hard work and co-operation which you have given us	I hope you will assure all those concerned that their work has played its part in our recent victories. I wish you all very good luck in the future." The 10th Battalion was never to see active service as a Battalion, but Officers and men who took part in the operation will not forget "BIG BOBS," their building after sundown through the Summer nights in the fields of Suffolk, on the beach at Folkestone, by the War Memorial and on the Marine Parade at Dover; their monstrous form of scaffolding and painted canvas on land, their incredibly lifelike appearance afloat, and perhaps above all, the general relief shortly before first light when the last BIG BOB scheduled for the night was safely towed away to its moorings. And when launching failed, the race to strip down before the first streak of dawn. Nor will they forget the willing co-operation they received from the Royal Navy, the Royal Marines, Colonel Furminger and the 4th Northamptonshire, and the many small Army detachments that became involved in preparation, building, launching and animation. On completion of Exercise "Quicksilver," notification came through from H.Q. 61st Division that the battalion would disband. This disbandment, however, did not take place, because the battalion was moved from Dover to a delightful place in Sussex called Sheffield Park, where it proceeded to re-train wounded returned from the Normandy battlefield. 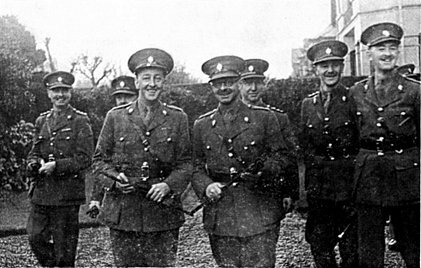 After 3 or 4 weeks, just as training was beginning to get into its stride, the role was again changed, and this time the battalion was divorced from 61st Division and despatched to Cavalry Barracks, Redford, Edinburgh, Scotland, where it performed the role of a Primary Training Centre. The battalion performed this role from November 1944, until April 1945; then once again it came South, this time to Worthing, Sussex, and until final disbandment on April 21st, 1945, formed a reception camp for returned prisoners of war.